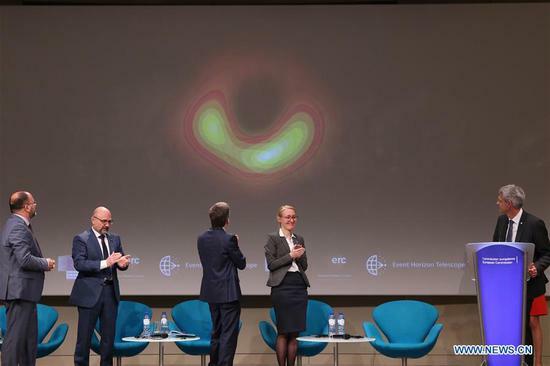 BRUSSELS, April 10 (Xinhua) -- Simultaneously with other six across the world, the European Commission held here a press conferences Wednesday afternoon to unveil the first image of a black hole as a significant breakthrough discovery in astronomy. The image shows a donut-like structure with a dark central region and a bright ring, which is the black hole's shadow against a disc of glowing gas that falls onto the black hole. With a mass 6.5-billion times that of the Sun, the black hole is at the heart of the distant galaxy M87, 55 million light-years away. The image provides the strongest evidence to date for the existence of supermassive black holes and opens a new window on the study of black holes, their event horizons, and gravity. "The history of man and of science will be divided into the time before the image and the time after the image. Black holes are stranger than anything dreamed up by science fiction writers, but they are firmly matters of science fact," said European Commissioner Carlos Moedas at the press conference. The unveiled image is a product of the project Event Horizon Telescope (EHT), which is a global effort to construct an Earth-sized virtual telescope array, able to actually "photograph" nearby supermassive black holes. "The results give us for the first time a clear view of a supermassive black hole," said Anton Zensus, director of the Bonn Max-Planck-Institute for radio astronomy, where the data of the participating radio telescopes were combined. The image is also a powerful confirmation of Albert Einstein's general relativity. "I'm really proud of the results," said Heino Falcke, chair of the EHT science council. "If immersed in a bright region, like a disc of glowing gas, we expect a black hole to create a dark region similar to a shadow -- something predicted by Einstein's general relativity that we've never seen before," Falcke explained. "This shadow, caused by the gravitational bending and capture of light by the event horizon, reveals a lot about the nature of these fascinating objects and allowed us to measure the enormous mass of M87's black hole," He added. In a statement released by the EU, President of the European Research Council (ERC) Jean-Pierre Bourguignon congratulated the scientists across the globe who had made this inspiring discovery and pushed the frontiers of human's knowledge. "I'm especially glad to see that scientists funded by the European Research Council contributed decisively to this breakthrough," said Bourguignon.